Together Delta Air Lines and Virgin Australia serve more than 170 million customers each year with a broad network of destinations to meet the needs of busy corporate travelers. 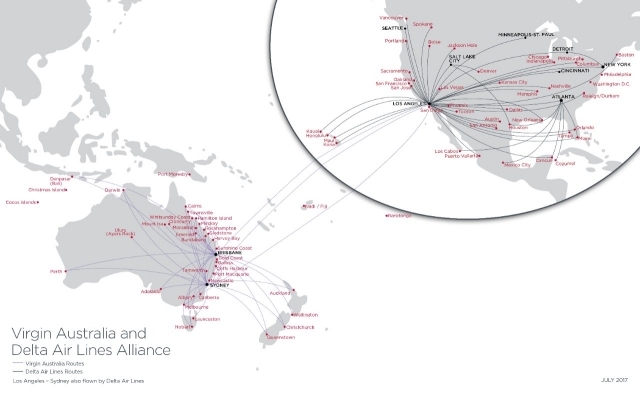 With our trans-Pacific partnership, you benefit from a comprehensive, fully integrated network with access to over 50 destinations in Australia and New Zealand and over 250 destinations in the United States, Mexico and Canada. This means you can look forward to more convenient connections and reciprocal frequent flyer benefits. More options when booking trans-Pacific travel on international long-haul including flights between Los Angeles and Sydney, Brisbane and Melbourne. More SkyMiles earning opportunities, as members purchasing an eligible Virgin Australia International fare-class ticket now earn Medallion Qualification Miles (MQMs) as well as miles. For travel agent resources and news, please visit the Virgin Australia travel agency website. For additional Virgin Australia information, please visit their website. What Does The Joint Venture Mean For You? Allows the airlines to collaborate through codesharing: Book passengers with one ticket on both carriers, allowing for simplified booking and mileage accrual. Gives travelers access to an ever-increasing number of cities across Australia, the United States and around the globe. Increased opportunity to take your business global while enjoying the benefits and perks of reciprocal mileage accrual and lounge access. Provides a wider choice of city pairs and departures for your top travelers, combined with more frequent service and shorter connection times on many routes. Simplifies the request for proposal (RFP) process by providing a one-stop shop. Participating airlines coordinate their response for customers, shortening the process by three to five weeks. Introducing ‘The Business,’ an exceptionally stylish and relaxing way to fly on Virgin Australia’s B777 aircraft. Stretch out in a private, cocoon-like suite enjoying the lavish comfort of a fully flat bed and the convenience of direct aisle access. Experience an impressive list of perks including priority check-in, boarding and baggage claim, gourmet meals designed by leading Australian chef Luke Mangan; premium beverage selection at our exclusive boutique sit-down bar. Immersive In-flight entertainment experience with personalized state-of-the-art 18” touch screen and noise-cancelling headsets or relax with a Turn-down service on request for your fully horizontal lie-flat bed stretching to 6'2"with luxurious duvet, pillows and Mandarina Duck amenity kits for the ultimate comfort. Economy Class is more than your typical economy. With ergonomically designed seats offering a generous 32" legroom and 6" recline in a spacious cabin with 3-3-3 seating configuration. 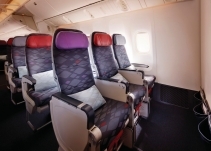 With all inclusive in-flight meal and alcoholic beverages, self-serve drink and snack stations and hours of on-demand entertainment at every seat with a 9” LCD touch screen plus a Virgin Australia amenity kit to make your flight more comfortable. Virgin Australia Lounges provide a stylish yet practical space in which to work, socialize or unwind in comfort prior to your departure. Delta offers full flat-bed seats with direct aisle access in Delta One™ on all transcontinental flights between New York-JFK and Los Angeles. Rest comfortably in a flat-bed seat all the way from New York-JFK to Australia/New Zealand when traveling in Delta One. Our cross-country service features upgraded amenities in the Delta Comfort+™ and Main Cabin. Flying from LAX Delta One and Delta 360™ members in any cabin can begin their premium flight experience with our private check-in. Westin Heavenly® In-Flight bedding and Tumi amenity kits with skincare products from New York’s MAIN+GOETZ in Delta One. Gourmet Delta One menu curated by Chef Michael Chiarello, and upgraded food for purchase in Main Cabin. Complimentary beer, wine and spirits for passengers in Delta Comfort+; expanded Delta WineMaker Series to Main Cabin. Main Cabin customers can choose from a special selection of food for purchase from our exclusive EATs menu including fresh, all-natural bites from Luvo. Complimentary newspapers in Delta One. Starbucks coffee served in all cabins. Delta Studio™, Delta’s industry-leading suite of onboard entertainment options, including the latest movies, live satellite TV, HBO®, SHOWTIME®, games and thousands of songs. All transcontinental flights arrive and depart from Delta’s new Terminal 4 at New York-JFK, which includes the new flagship Delta Sky Club® featuring the Sky Deck at Delta Sky Club.